We will only collect, store and use your personal information for specific purposes as outlined below in accordance with GDPR. We use your personal information to support and develop our connection with you. We will never share your personal data with 3rd parties unless necessary to provide you with the appropriate desired service or if required by law and your data is always protected. You may contact Decorative Details at any time with any privacy queries or concerns and to see the personal data you have given us and request modification. 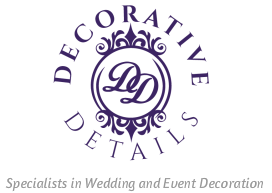 If you need to get hold of us for any reason in connection with your personal data, please email us at: info@decorativedetails.co.uk. We are: Decorative Details of 4 Tandey Walk, Innsworth, Gloucester, GL3 1HL. You have the right to make a complaint at any time to the Information Commissioner’s Office (ICO), the UK supervisory authority for data protection issues (www.ico.org.uk). We would however, appreciate the chance to deal with your concerns about data protection before you approach the ICO so please contact us in the first instance. When you contact us to enquire about our services, we ask for data such as your name, e-mail address, billing address and contact details. Decorative Details keeps a record of this information for tax purposes and for ensuring we fulfil our contract with you. The only personal information we hold is what our clients provide to us when they enquire about our services or sign a contract. We share it with nobody, however it is stored on relevant systems such as Google Drive and Couriers (to pass addresses to) and accounting systems which are GDPR compliant. If we are required by law to share any information, we will check with each party concerned to ensure they are happy for that to happen. An example of this would be if HMRC requested an audit. When you place an order with Decorative Details you will be asked whether you’d like to consent to us displaying your order as part of our marketing materials. By giving your consent for us to do this you understand your personal data will be in the public domain and we assume no responsibility for the usage of this data subsequently. You may request to have your personal data removed at any time and we are more than happy to comply within 7 working days. Decorative Details kindly request that you do not supply any other person’s personal data to us, unless required by law or you have their explicit consent to do so. Wedding Data includes wedding date, wedding budget, spouse name, wedding role, wedding location, supplier bookings. Correspondence Data includes email correspondence and Identity Data. Where you provide us with personal data belonging to another person (including sensitive data) we do not control that personal data and will act only as processor of that personal data in accordance with our obligations contained in our terms and conditions. Direct interactions. We collect the majority of your data when you choose to give this to us either through our website, when we meet at open days or wedding fayres, by email or otherwise. The data that you choose to provide to us helps us to organise the necessary elements of your wedding or event and provide you with specific, tailor-made services. search information providers based outside the EU. In respect of your Sensitive Data, we will only collect this from you where you provide this information voluntarily because you think that it helps you to organise and arrange your wedding or event more thoroughly. Where you do so, we will take this as a clear affirmative action signifying your agreement to the processing of your Sensitive Data. You may withdraw our right to process your Sensitive Data on your behalf at any time. Contract – customers that place an order with Decorative Details. We may need to share your personal data with the parties set out below for the purposes set out in the paragraph above. Analytics and advertising service providers which may have servers based in the US – for the purpose of analysing user behaviour & re-targeting. Third parties to whom we may choose to combine parts of our service with. We require all third parties to respect the security of your personal data and to treat it in accordance with the law. We do not allow our third-party service providers to use your personal data for their own purposes and only permit them to process your personal data for specified purposes and in accordance with our instructions. We recognise that the Internet is not a 100% secure platform for communication and accordingly we cannot guarantee the security of any data you send to us (or we send to you) via the Internet. We are not responsible for any damages which you, or others, may suffer as a result of the loss of confidentiality of such information. We take every precaution to safeguard your information. We have put in place appropriate security measures to prevent your personal data from being accidentally lost, used, accessed, altered or disclosed in an unauthorised way. All personal data stored by us is kept in a secure environment. The computer on which data is accessed on is password protected, data held in the cloud is password protected and held on encrypted systems and third-parties have their own security systems. We will only retain your personal data for as long as necessary to fulfil the purposes we collected it for, including for the purposes of satisfying any legal, accounting, or reporting requirements. Email addresses provided are stored until consent is withdrawn. Information required for tax and legal requirements are held for 6 years as required by law. Under GDPR you have a right to be forgotten, to withdraw your consent, to change information we hold about you and to restrict processing. Decorative Details are more than happy to comply with this in accordance with the law.